A new multi-million dollar value-added sawmill is now up and running on the site of a former Domtar mill in Ontario, processing eastern white cedar that had previously been shipped out of province for milling. A PHL double-cut bandsaw in the main breakdown unit at the Niska North sawmill in Chapleau, Ontario. The Cardinal Group was the main equipment supplier. Some of the best ideas in the Canadian forest industry actually start with independent business people willing to take a chance on a new concept or product, with the hope of hitting a financial home run. That's what Niska North of Chapleau, Ontario, represents. The company's two business partners, Wade Cachagee and Kevin Lindquist, have detailed knowledge of the forest resource in northern Ontario through their ownership of the well-established forest information services firm, Cree-Tech. They are now tying that knowledge to a new flexible, value-added sawmill that is capable of high overall utilization of a variety of wood species. This is the type of sawmill that must take hold in Canada if the forest industry is to flourish. 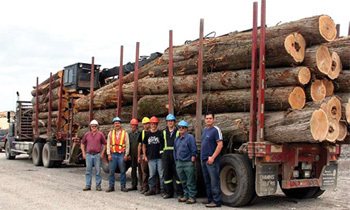 What they have established in central Canada is the type of forest products business that B.C. 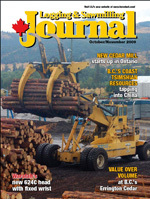 Coastal sawmills are being strongly encouraged to consider to make better use of, for example, the underutilized hem-fir resource. Niska North won a Request for Proposals (RFP) competition held by the Ontario government to acquire 60,000 cubic metres of eastern white cedar, spread over a massive 60,000 square kilometre area. Until recently, a significant portion of that wood resource was being transported out of province. "We were successful in putting a business plan together, in terms of showing where our markets are, where our finances are going to go, what facility we would use, what equipment we would use, and we detailed the skillsets that our people needed to have to make this a viable project," says Cachagee. He pegged the cost of the sawmill at under $20 million. As part of their business plan, the partners were able to provide a detailed map, showing the distribution of cedar throughout an area from Sault Ste. Marie in the south to Hearst in the north, Foleyet to the east and White River to the west, representing 18 per cent of the entire Ontario land base. That's because cedar represents only five per cent of the forest. Niska North needs to gather its wood supply from six management units versus the same volume of wood that a typical, commodity-based sawmill would acquire from one management unit. The new Niska North sawmill is located in about 13,000 square feet of a 75,000 square foot industrial building--previously a Domtar sawmill--that was built in 2000. The partners' initial survey of the cedar resource showed that Chapleau was at the exact centre of the wood supply. It will take a substantial amount of coordination with Sustainable Forest Licence (SFL) holders to identify pockets of cedar, sort the timber at roadside, and deliver it to Niska North in Chapleau. The carrot for SFL holders and the company's forest industry partners is that in exchange for providing Niska North with cedar, they will be assisted with road management costs, which will get their fibre out at a little cheaper rate. Niska North is interested in a lot more than just the cedar. Their work with Cree-Tech since 1995 has also led them to believe that there is a significant resource of other underutilized species--particularly in northeastern Ontario. "Our facility is equipped to handle any species, really," says Cachagee. For example, over the past winter, Niska North manufactured products from cedar, aspen, tamarack, white pine, jack pine, and white birch. The sawmill began operating in December 2008. "It's a two-way street," says Cachagee, describing the company's relationship with other forest companies and SFL holders. "If they come into incidentals or other species that they don't use in their facility, but are almost in their way or part of a current specific logging operation, they can tell us what is available and we can shop that around." Conversely, companies will be encouraged to hunt the forest for cedar when there is a strong market for those products. "It's a win-win situation for everybody," says Cachagee. "We get our fibre, and even though we are in the sawmill business, we are value-adding and are not directly competing with them. We are actually helping each other." The major difference between Niska North and commodity sawmills is that all of its products are appearance grade products. Given their knowledge of the forest business in northern Ontario, the Niska North owners are also well acquainted with local harvesting and haul rates. "We are able to sit down with companies and negotiate those rates based on the product that we require," says Cachagee. The sawmill itself represents a major boost to both Chapleau and the Ontario forest industry. Although Chapleau has historically had a strong forest industry presence, it has suffered recently with the closure of several area sawmills. Niska North has purchased a former Domtar sawmill site that has sat dormant since 2005, and expects that at least 40 new direct sawmill jobs will be created. A truckload of cedar headed for the Niska North sawmill (below). The cedar supply for the sawmill comes from a massive 60,000 square kilometre area, representing a staggering 18 percent of Ontario's landbase. The design of the sawmill is a major reason why Niska North has a high probability of success, even in these difficult market conditions. "We are what I would call a flexible facility," says Cachagee, "where we can do various species. We can also do products in up to 24 foot lengths, we can do oversize stuff and we've done large timbers for bridge orders. We can do small interior/exterior paneling and decking, radial-edge decking, and fence products with our moulding equipment." The company is also able to manufacture components for log homes, flooring, siding, as well as door and window components. These are just some of the products the company has identified so far. The sawmill is also designed so that they can be manufacturing a decking product one day, and timbers the next day. It took a year to install the new sawmill, which is located in about 13,000 square feet of a 75,000 square foot industrial building that was built in 2000. "It was an opportunity that really fit what we needed," says Cachagee, "and the room for expansion is just great." The first thing the owners did was hire a mill manager, Bob Roberge, with over 30 years' experience. They acted on his advice and worked with equipment supplier, the Cardinal Group, to build a unique, flexible, smaller scale facility. Cardinal did the engineering for the sawmill, in terms of the framing, transfer decks and roll cases. Logs are debarked on a Morbark rosserhead debarker, and are processed through a PHL double-cut band saw. The sawmill can accept logs up to 44" in diameter, up to 24' in length. 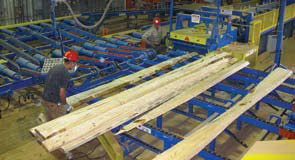 Boards are processed through a three-saw moveable edger. Cants can be redirected to a resaw to capture higher value or trimmed and directed to the manual sorting line. "What is unique about our operation is that at every station, whether a person is on a trim saw or on edging, every employee is making a decision that is going to allow us to sell a product at a certain price," says Cachagee. "So they can downgrade or enhance our product." Employees have the choice of either allowing the material to continue down the green chain, redirecting it to the resaw, stockpiling it for processing later, or sending it to the chipper. The mill is designed so that material can be processed and stockpiled, and then later be reintroduced at key points in the production chain. "Also, if our debarker and carriage goes down, the mill can still run," says Cachagee. "We can still bring in wood from elsewhere." The same holds true if the edger, trimmer, and resaw go down. The sawmill can still process logs through the debarker and carriage. So the debarker and carriage could actually be manufacturing timbers from one species, with the material being stockpiled, while another species and type of product could be processed starting at the edger. The sawmill has been described as not necessarily high tech, but very efficient and flexible. All of the equipment was purchased new, except for the chipper and resaw, which were refurbished from the equipment that was left over from the old Domtar sawmill. The lumber is manually stacked and currently air dried, and then planed and moulded. Eventually, the company will have four operating moulders, but as Cachagee pointed out, the sawmill is still somewhat in start-up mode and testing the market to see where there is the greatest product demand. Equipment will be put into production mode as the market demand for products develops and justify its commissioning. For example, Niska North is in the process of working with Nyle Corporation to supply them with up to eight dehumidification kilns, which is a more suitable and efficient way to dry lumber for the production of appearance grade products. Installation will be completed this fall. Niska North also prides itself for being as green as possible. The facility is heated with wood waste generated from the facility and the dry kilns will also be assisted with a wood waste hot water boiler unit. The facility is certified by the Forest Stewardship Council (FSC). For the moment, Niska North is focusing on establishing domestic markets for its products. "We're not trying to sell everywhere right away," says Cachagee. "We want to get a series of confident programs with our main customers so that we can get the ball rolling and start ramping up. Once we generate revenue, we can invest in new ideas, new markets, new products and new equipment." Ironically, eastern white cedar has really not been heavily sold and marketed in Ontario because a lot of the product has been sent out of province for processing. So a potential market exists right in Niska North's backyard. A First Nations forestry company, Coast Tsimshian Resources, is working hard to create new business opportunities abroad--by opening a trade office in Beijing--and at home in northwestern British Columbia. A group of New Brunswick entrepreneurs have taken a fence company that had closed its doors and turned it around, utilizing almost every scrap of wood--and along the way, getting the most out of their residual wood. B.C. 's Errington Cedar takes a different mill approach, in that it's all about value, value, value, rather than production, production, production. Waratah's new HTH624C processing head and Waratah's new fixed wrist to work--and the combination is getting praise from operators. The industry has been beaten up and battered lately, but Tony Kryzanowski asks the question: Is the Canadian forest industry ready for the recovery?